Background: Tetralogy of Fallot (TOF), the most common cyanotic heart defect and one of the most common congenital heart diseases, occurs mostly sporadically and nonsyndromically. The underlying molecular genetic mechanism is not known. Therefore, the existence of mutations in the homeodomain-encoding region of NKX2.5 gene in Iranian patients with tetralogy of Fallot is evaluated. Materials and Methods: In the present study, we analyzed the peripheral blood samples of27 patients in order to find any mutation in the 180 bp homeodomain-encoding region of NKX2.5 gene, which is known to be involved in heart development and diseases. 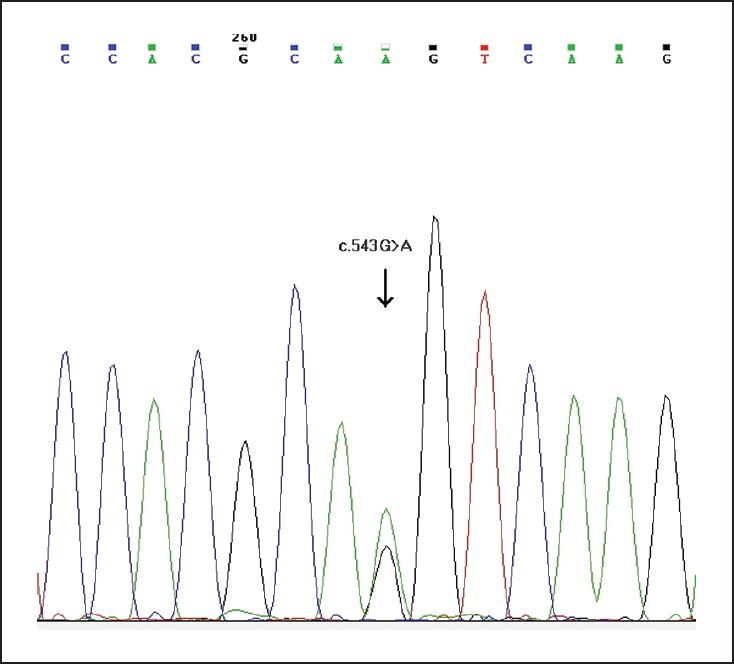 DNA was extracted and all the samples were amplified by polymerase chain reaction (PCR) and sequenced. Results: Twenty-seven patients were included in the study. Twenty-five of them were infants and children (6 days to 11 years of age), one was a teenager (14-years of age), and another was a 33-year-old man [mean ± standard deviation (SD): 5.80 ± 3.90 years]. Thirteen patents were males (mean ± SD: 6.587077 ± 5.02 years) and 14 were females (mean ± SD: 5.0726 ± 2.81 years). 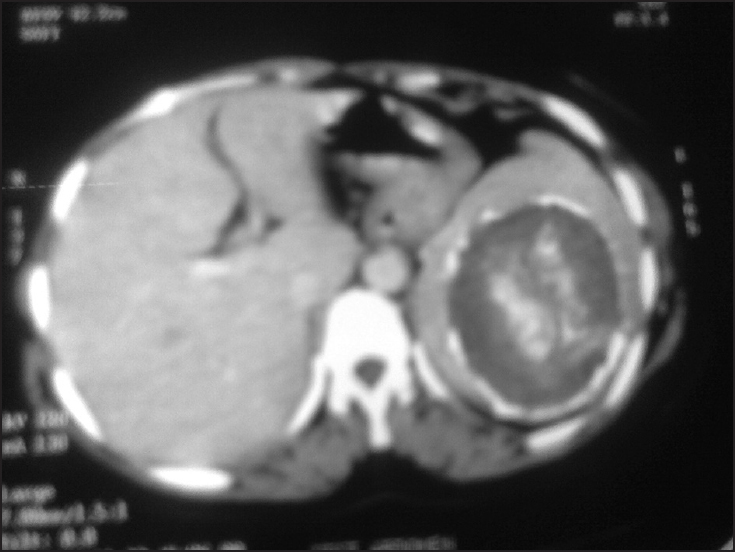 One synonymous variant, i.e., c.543G>A was identified in one patient. Conclusion: Mutations in the homeodomain-encoding region of NKX2.5 gene may not have an outstanding role in etiology of tetralogy of Fallot patients in Iran. Background: Neurological complications are a problematic factor in acute bacterial meningitis; hence, its prevention is the key to ensure the success of meningitis treatment. Glycerol and dexamethasone are both applied in this regard. Oral glycerol is an appropriate alternative instead of intravenous dexamethasone because it does not have problems related to intravenous injection, the high cost, and drug complications. The main objective of this study was to compare the efficacy of adjuvant dexamethasone versus glycerol in order to improve the clinical outcome of bacterial meningitis. Materials and Methods: We conducted a search on the available resources including PubMed, Ovid, Elsevier, Cochrane, and another search engines such as Google till 2014. All clinical trials that were performed in the field of comparing the effectiveness of the two drugs and met the inclusion criteria were gathered and after extraction the relative risk (RR) values, the pooled RR was calculated. The main outcome was neurological complications. Meta-analysis of the data was performed in Stata version 11.2 using both fixed and random effect models, weighting each study by inverse of variance. 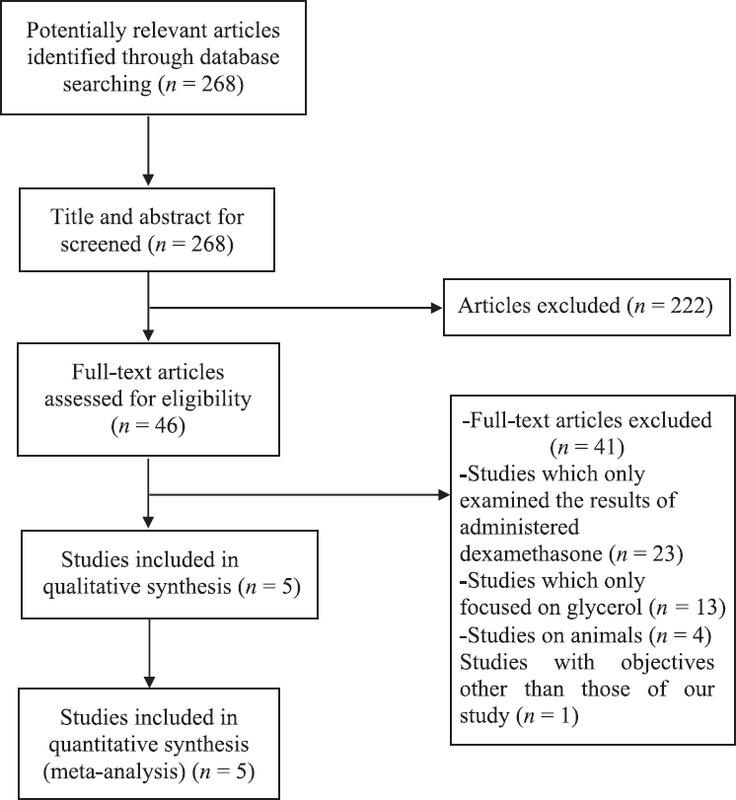 Results: In 5 comparative studies (1,340 patients), the rate of neurological complications of glycerol compared to that of dexamethasone was 1.02 [95% confidence interval (CI), 0.98 compared to 1.12]. The rate of neurological complications of dexamethasone compared to dexamethasone + glycerol was 1 (95% CI, 0.97 compared to 1.03), dexamethasone compared to placebo was 0.99 (95% CI, 0.97 compared to 1.03), glycerol compared to glycerol + dexamethasone was 0.98 (95% CI, 0.94 compared to 1.02), and glycerol compared to placebo was 0.97 (95% CI, 0.94 compared to 1.01). In these studies, no difference was reported between dexamethasone and glycerol in terms of reducing neurological complications. Conclusion: Although there were some weak evidences for the nonstatistical significant effect of glycerol in the prevention of neurologic complication after meningitis, there was no difference between glycerol and dexamethasone. Dual malignancy is rare in adolescents. Dual malignancy with the second malignancy of thyroid is rare. No association has been reported between dysgerminoma of ovary and carcinoma thyroid in medical literature. Despite a thorough PubMed search (key words - Papillary carcinoma of thyroid, metachronous, dysgerminoma ovary), we were unable to find a previous reported case of metachronous papillary carcinoma of thyroid (PTC) following dysgerminoma of the ovary. After surgery, the patient is being regularly followed up for recurrence/development of new primary. 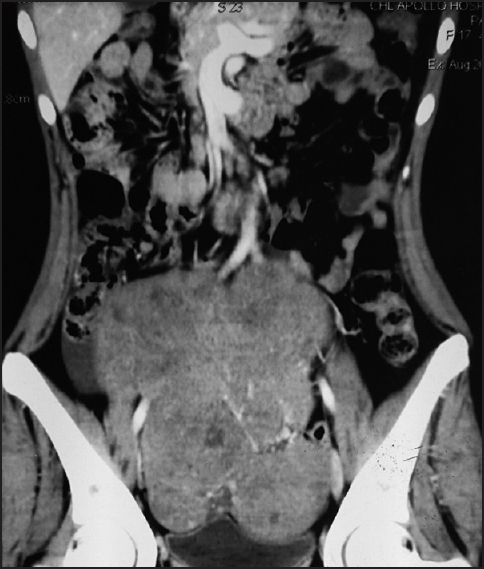 We report this unusual and rare case in a 17-year-old female patient. Background: Different populations have shown various patterns of association between impaired fasting glucose (IFG) and body composition parameters and risk factors of cardiovascular disease (CVD). The current study aimed at investigating the differences between persons with prediabetes and healthy people in terms of CVD risk factors including body composition parameters, blood pressure, and lipid profile in a sample of the Iranian population. Materials and Methods: In a case-control setting, a sample containing 386 (193 prediabetic subjects and 193 normal subjects) of the first-degree relatives of diabetic patients aged 35-55 years were investigated. Samples were assessed using glucose tolerance categories. Prediabetes was defined according to the American Diabetes Association (ADA) criteria. Body composition parameters, blood pressure, glucose parameters, and lipid profile were measured and compared between the two groups. Results: Prediabetic patients had higher body mass index (BMI), waist circumference (WC), and body fat (BF) in comparison to the control group (P < 0.05). In addition, prediabetic subject had a higher intake of energy, carbohydrate, protein, fat, and cholesterol and it seems that these patients had an unhealthy dietary intake (P < 0.05). Fasting blood glucose (FBG) (P < 0.001), total cholesterol (P = 0.007), low-density lipoprotein cholesterol (LDL-C), and triglyceride (P = 0.021) were higher in prediabetic patients (P < 0.05) than in the controls. Conclusion: Both the risk factors of CVD and body composition parameters were different between the prediabetic and normal groups; total cholesterol (TC), triglyceride (TG), and FBS were predictors of the risk of prediabetes. Original Article: Is type 2 diabetes mellitus in mechanically ventilated adult trauma patients potentially related to the occurrence of ventilator-associated pneumonia? Background: Ventilator-associated pneumonia (VAP) is a type of lung infection that typically affects critically ill patients undergoing mechanical ventilation (MV) in the intensive care unit (ICU). Patients with type 2 diabetes mellitus (T2DM) are considered to be more susceptible to several types of infections including community-acquired pneumonia. However, it is not clear whether T2DM is a risk factor for the development of VAP. The purpose of this study was to determine the risk of VAP for diabetic and nondiabetic mechanically ventilated trauma patients. 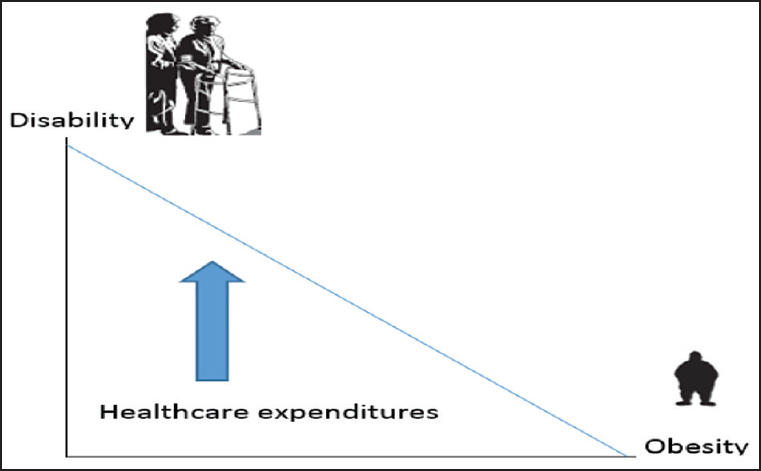 Materials and Methods: This study is a secondary analysis of a prospective observational study of the history of T2DM in the ICU over a period of 1 year at Imam Khomeini Hospital in Iran. A total of 186 critically ill trauma patients who required at least 48 h of MV were monitored for the occurrence of VAP by their clinical pulmonary infection score (CPIS) until ICU discharge, VAP diagnosis, or death. Results: Forty-one of the 186 patients developed VAP. The median time from hospitalization to VAP was 29.09 days (95% CI: 26.27-31.9). The overall incidence of VAP was 18.82 cases per 1,000 days of intubation (95% CI: 13.86-25.57). 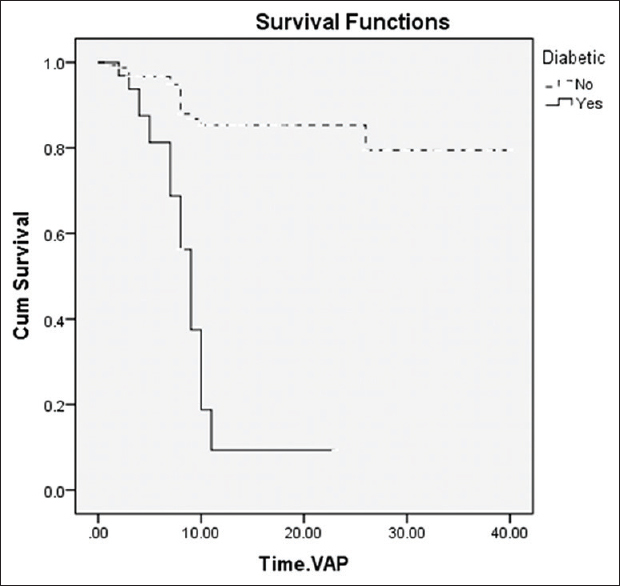 Risk of VAP in diabetic patients was greater than nondiabetic patients after adjustments for other potential factors [hazard ratio (HR): 10.12 [95% confidence interval (CI): 5.1-20.2); P < 0.0001)]. Conclusion: The findings show that T2DM is associated with a significant increase in the occurrence of VAP in mechanically ventilated adult trauma patients.